Google Glass, the head-mounted wearable computer unveiled more than two years ago, is finally available outside the US. After appearing in a support page linked to hardware availability, Google has launched the long-awaited device in the UK. The Explorer Edition is being sold through the Google Play store for £1,000 and is available in Cotton, Charcoal, Tangerine, Shale and Sky. Google is also selling the frames from its Titanium collection as an optional add-on. Each Explorer Edition comes with an extra frame or shade for free; otherwise, the frames are being sold for £175 each, while the shades cost £120 individually. For the serious enthusiast, Google is offering a wealth of accessories too. Stereo earbuds are being sold for £65, while the mono iteration is available for a slightly cheaper £40. Both come with the V-shaped Glass branding on the outside. A padded case or pouch will set you back £40, while a Clear Shield visor costs £60. All items are currently listed to ship within one to two business days. If you live in London, there’s also the chance to try Glass at one of Google’s demo days on June 27-28. You can RSVP here if you’re interested. To coincide with the launch, the Guardian has released its first Glassware, aptly called ‘the Guardian for Glass.’ The app offers breaking news notifications and special reports, with the option to have them delivered as audio files. 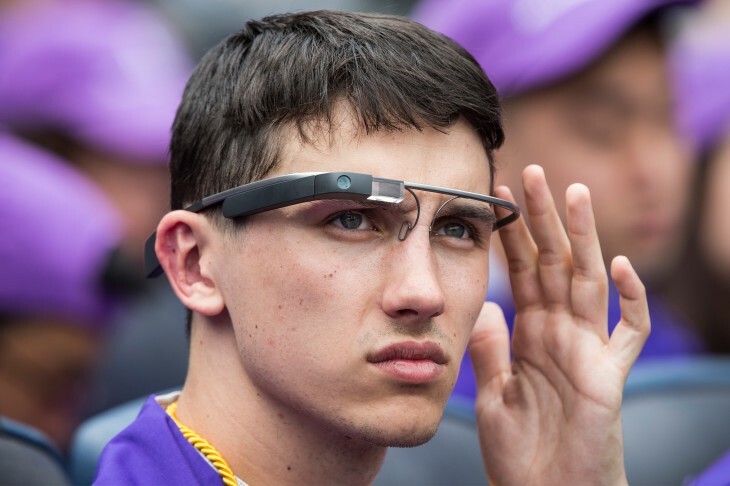 “What intrigues us most about Google Glass and other wearable devices are the new journalistic opportunities they provide, and how they allow us to collaborate with our readers around the world while respecting their privacy,” Alan Rusbridger, editor-in-chief for Guardian News & Media said. Google marked the release of Glass in the UK with a short promo video. It covers soccer, cycling, black cabs – everything synonymous with the city, in short. The rate of development for Glass has been glacial. Google has mainly focused on its ‘Explorer’ developer program in the US, keeping public sales to a minimum. That changed recently with an open beta program and a new collection of frames designed by Diane von Furstenberg, however. The limited-edition specs were made available earlier today through online fashion retailer Net-A-Porter in the US, as well as the Glass store. With Google’s I/O developer conference taking place later this week, we suspect we’ll be hearing a lot more about Glass shortly.